WeissCANNON, a true innovator in the world of tennis string manufacturing, is highly respected due to the quality and innovation of the product line they have developed. The Red Ghost catapults string technology forward at least 10 years with an innovative design that delivers on-court performance that borders on being so good it's downright scary! Construction: A brand new hyper-poly composite, offers tremendous feel and controllable power. Combined with WeissCANNON's unique "grooved ridge to the 7th power" extrusion method, this string is truly unique to the world of poly-based offerings blending silken properties with grooved ridges to produce easy spin with outstanding all-around play. Advantage: A string that expertly blends the desirable characteristics of comfort, control, spin, power and feel into one string. Hauntingly good play as a full setup and also blends nicely with other polys and natural gut. 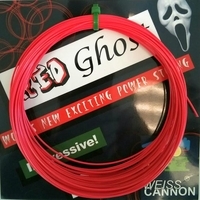 The neon red color signifies the bold playing potential of the string and is entirely appropriate because when using Red Ghost, your game will be on fire!